Celiac disease is a common cause of chronic diarrhea and malabsorption syndrome all over the world. Though it was considered uncommon in India in past, it is being described frequently recently. Some patients with celiac disease do not improve despite gluten free diet (GFD). A study described 15 cases of celiac disease unresponsive to GFD in whom small intestinal bacterial overgrowth (SIBO) or lactose intolerance was the cause for unresponsiveness. During a three-year period, 12 adult patients with celiac disease were seen in the Luminal Gastroenterology Clinic in a tertiary referral center in northern India. Two of these 12 patients (16.6%), who did not fully respond to GFD initially, are presented here. Unresponsiveness resulted from SIBO in one and lactose intolerance in the other. The former patient responded to antibiotics and the latter to lactose withdrawal in addition to standard GFD. In patients with celiac disease partially responsive or unresponsive to GFD, SIBO and lactose intolerance should be suspected; appropriate investigations and treatment for these may result in complete recovery. Celiac disease is a common cause of chronic diarrhea and malabsorption syndrome (MAS) all over the world. Though it was considered uncommon in India in past, it is being described frequently recently [1, 2]. Some patients with celiac disease do not improve despite gluten free diet (GFD). Tursi et al described 15 cases of celiac disease unresponsive to GFD in whom small intestinal bacterial overgrowth (SIBO) or lactose intolerance was the cause of unresponsiveness . We describe two adult patients with celiac disease only partially responsive to GFD; unresponsiveness resulted from SIBO in one and lactose intolerance in the other. During a 3-y period from July 2000 to July 2003, 12 adult patients with celiac disease diagnosed using standard criteria  were seen in the Luminal Gastroenterology Clinic of the Department of Gastroenterology in a tertiary referral center in northern India. All except two (16.6%) of them responded clinically to GFD. The data of the two patients, who were initially unresponsive to standard GFD is presented below. A 35-y-old female presented with chronic large volume diarrhea for more than 3-y. She passed 20 liquid (including nocturnal), frothy, pale, greasy, unusually offensive stools. She never passed blood with these stools. She lost 11 kg weight in 3 y. She had temporary reduction in diarrhea and gain in weight while on anti-tubercular drug therapy given 3 mo after onset of this disease. She was emaciated (body mass index 13.7 kg/m2), pale, had angular stomatitis and clubbed fingers. Investigations revealed: Hb 98 g/L (normal 120–150), total leukocyte count 5.9 × 109/L (normal 4.0 – 11.0 × 109) with normal differential counts, serum albumin 30 g/L (normal 40–60), serum iron 9.7 μmol/L (normal 11–29); serum bilirubin and transaminases were within normal limits. ELISA test for human immunodeficiency virus was negative. Sudan III stained spot-stool specimen showed 15 fat droplets/high power field (normal ≤10); urinary excretion over 5 h after ingestion of 5 g D-xylose was 0.29 g (normal ≥1 g). Esophagogastroduodenoscopy revealed flattened duodenal folds and biopsy revealed subtotal villous atrophy, crypt hyperplasia and increased intra-epithelial lymphocytes (Marsh's stage IIIB) . Jejunal aspirate culture by a method described by us previously [5, 6] revealed growth of Klebsiella pneumoniae and Pseudomonas aeruginosa (colony counts >105 CFU/ml). Glucose hydrogen breath test (GHBT) by a standard method  revealed fasting value of 36 ppm and highest value of 200 ppm 60 minutes after 100 g glucose. This was interpreted as a positive test for SIBO as per standard criteria . Lactulose hydrogen breath test by a standard technique  revealed two peaks; the first peak was at 110 min after 15 ml lactulose (24 ppm above basal, basal value 17 ppm); this could be related to SIBO. The time to second peak was 200 min (which corresponds to oro-cecal transit time, OCTT) after lactulose ingestion (21 ppm above basal). Therefore, OCTT was prolonged (median value in healthy subjects in India 65 min, range 40–110) . The subsequent treatment and course is depicted in Fig. 1. 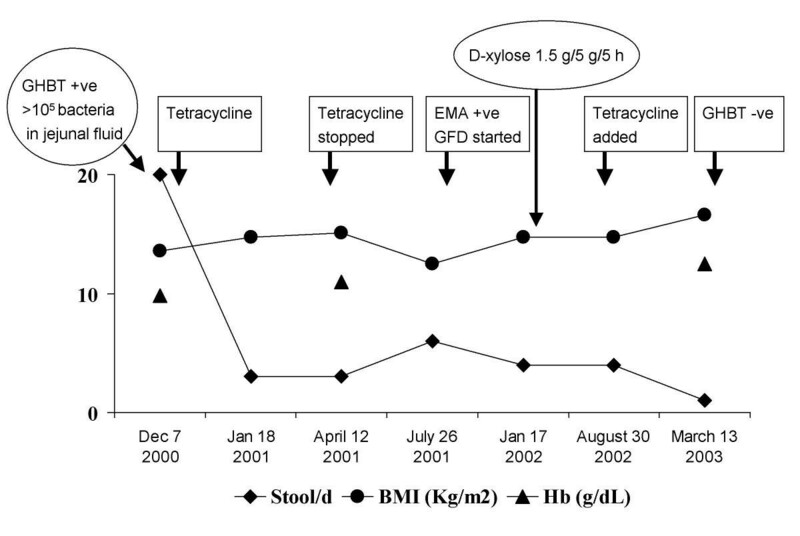 Though she responded to treatment with tetracycline 500 mg t.i.d over 2 months, diarrhea recurred with reduction in body weight 3 months after stopping the drug. At this time, result of anti-endomysial antibody test using indirect immunofluorescence assay (Binding Site, UK) was available and was positive. She was started on GFD. Despite good compliance to it, there was inadequate symptomatic response (Fig. 1), even though D-xylose test result was normal one y after presentation [urinary excretion over 5 h after ingestion of 5 g D-xylose 1.5 g (normal ≥1 g)]. 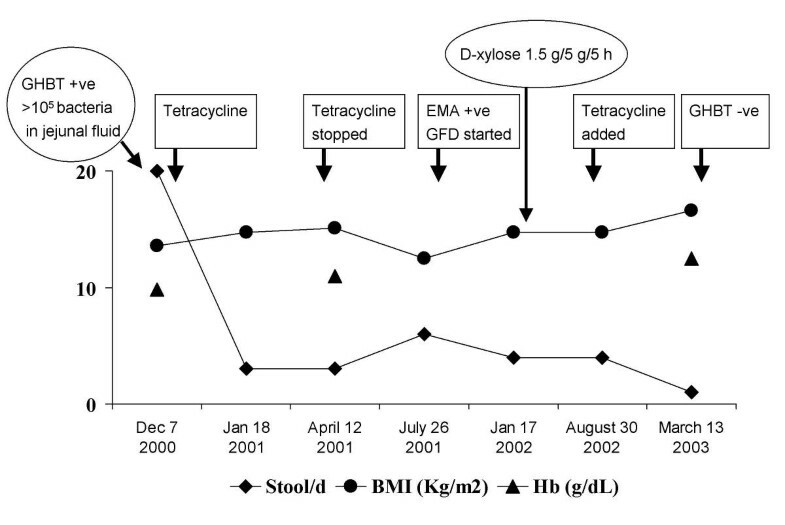 In view of finding SIBO at presentation and transient response to antibiotics, tetracycline was re-started. She improved symptomatically with gain in weight and normalization of hemoglobin. 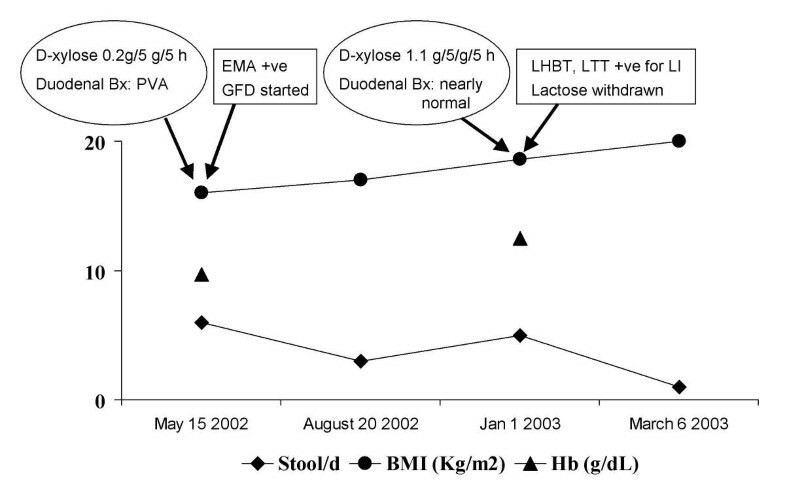 GHBT repeated at this stage failed to show persistence of SIBO. Course of a patient with celiac disease. Her response to gluten free diet (GFD) was inadequate despite a good compliance. This might have resulted from small intestinal bacterial overgrowth (SIBO) as addition of antibiotics with disappearance of SIBO (as evidenced by a negative glucose hydrogen breath test, GHBT) resulted in resolution of symptoms. EMA: anti-endomysial antibody. A 44-y-old female presented with large volume diarrhea for 14 y. She passed 6–7 large volume, watery, explosive stools everyday (including nocturnal). She gave history of reduction of diarrhea on fasting and increase on taking milk. She lost 9 kg weight in last 1 y. Antibiotic therapy resulted in some reduction in stool frequency. Physical examination revealed pallor and emaciation (BMI 16 kg/m2). There was no clubbing, lymphadenopathy or organomegaly. Investigations revealed: Hb 97 g/L (normal 120–150), total leukocyte 7.7 × 103/L (normal 4.0 – 11.0 × 109) with normal differential counts, serum bilirubin 10.3 μmol/L (normal 2–18), alanine aminotransferase and alkaline phosphatase 29 U/L (normal 0–40) and 88 U/L (normal <150), respectively. Serum total protein and albumin were 57 and 27 (normal 60–84 and 35–55) g/L, respectively; creatinine and fasting blood glucose were 53 μmol/L (normal 50–110) and 3.8 mmol/L (normal 3.9–6.1). ELISA test for human immunodeficiency virus was negative. Stool microscopic examination did not show ova, cyst or parasite; fat in spot stool specimen stained with Sudan III stain was 16 droplets/HPF (normal ≤10 droplets/HPF); urinary excretion over 5 h after ingestion of 5 g D-xylose was 0.18 g (normal ≥1 g). Serum immunoglobulins were within normal limits. Esophagogastroduodenoscopy was normal and duodenal biopsy revealed mild villous atrophy and broadening, crypt villous ratio 1:2 (normal 1: 3 to 5), lymphomononuclear infiltrate in lamina propria and increased intra-epithelial lymphocytes (Marsh's stage IIIA) . Antiendomysial antibody using indirect immunofluorescence assay (Binding Site, UK) was positive. Gluten free diet was started. The subsequent course is shown in Fig. 2. Though she responded to GFD to which she was fully compliant, loose stool continued with a frequency of 4 to 5/d even 8 months after GFD. Anti-endomysial antibody repeated at this stage was found negative. D-xylose test repeated at this stage showed normal result [urinary excretion over 5 h after ingestion of 5 g D-xylose 1.1 g (normal ≥1 g)]. A duodenal biopsy repeated 18 mo after GFD revealed maintained villous architecture, mild lymphomononuclear infiltrate in lamina propria and mildly increased intra-epithelial lymphocytes (Marsh's stage I). In view of nearly normal villous morphology and function as was evidenced by normal D-xylose test and negative anti-endomysial antibody an osmotic cause like lactose intolerance was suspected. Lactose tolerance test and lactose hydrogen breath test were done with 50 g oral lactose. Fasting blood glucose and breath hydrogen were 4.6 mmol/L and 10 ppm, respectively; 1 h post lactose values were 5.2 mmol/L and 36 ppm respectively. She had symptoms in the form of loose stools during 3-h observation period. Based on these, a diagnosis of lactose intolerance was made and lactose-free diet was started; diarrhea resolved during follow-up (Fig. 2). Course of the other patient with celiac disease. Her response to gluten free diet (GFD) was inadequate despite a good compliance as she continued to pass 4–5 liquid stools/day. She was found to have lactose intolerance (LI). Inadequate response to GFD might have been due to LI as withdrawal of lactose from diet resulted in complete resolution of symptoms. Other abbreviations used: Bx: biopsy; PVA: partial villous atrophy; EMA: anti-endomysial antibody; LHBT: lactose hydrogen breath test; LT: lactose tolerance test. Diagnosis of celiac disease in both the patients was established on standard criteria . We have earlier shown that half of patients with MAS resulting from various causes including celiac disease may have SIBO . In patients with tropical sprue it resulted from small intestinal stasis as evidenced by prolonged OCTT . Similar mechanisms may operate in patients with MAS due to other causes; the patient with celiac disease with SIBO in this report had prolonged OCTT. Prolonged OCTT has been reported by other workers in patients with celiac disease, which normalized after GFD . Unabsorbed foods within the intestinal lumen may also promote growth of bacteria in small intestinal lumen. We believe that SIBO in patients with MAS due to another cause may have following clinical significances, (1) a response to antibiotics may lead to a fallacious diagnosis of tropical sprue as response to antibiotics has been considered to be an important criterion for diagnosis of this disease ; (2) it may be a cause for inadequate response or refractory state despite GFD as occurred in our first patient and as has been reported by Tursi et al . Lactose intolerance could be another cause for such inadequate response to GFD. Lactase deficiency causing intolerance to lactose is known to be either primary or secondary; though in our patient, whether it was primary or secondary is a matter of conjecture, the latter is more likely as degenerated intestinal epithelial cells in patients with celiac disease are often found to have sparse endoplasmic reticulum, reflecting low level of digestive enzymes including lactase ; primary lactase deficiency is somewhat uncommon too . However, a definite diagnosis of lactose intolerance is important as a firm diagnosis helps the clinician as well as the patient to completely withdraw lactose containing foods, compliance to which may not be so easy for a patient with celiac disease already on significant dietary restriction without a definite diagnosis, particularly if the patient is vegetarian. The second patient continued to have diarrhea despite improvement in D-xylose test and duodenal biopsy, which led us to suspect a predominantly osmotic factor as the cause of diarrhea. Therefore, we investigated for lactose intolerance contributing to osmotic diarrhea. Normal result of D-xylose test was helpful as it suggested normalization of intestinal mucosa; D-xylose test has a high sensitivity to detect abnormal mucosa causing MAS . In fact, serial tests of intestinal permeability, which are based on a principle similar to D-xylose test, have been used successfully to non-invasively predict normalization of intestinal mucosa before undertaking invasive tests like endoscopic duodenal biopsy . Small intestinal bacterial overgrowth in patients with celiac disease may lead to persistent diarrhea due to disturbances in luminal digestion and alteration of mucosal function, albeit minor . Bacteria in small intestine in patients with SIBO causes deconjugation of bile acids, which causes watery diarrhea due to stimulation of colonic secretion and steatorrhea due to depletion of bile acid pool . Lactose intolerance results in persistence of diarrhea mainly due to osmotic effect of unabsorbed lactose and flatulence due to production of gas from fermentation of unabsorbed lactose. Refractory celiac sprue is defined as an initial (primary) or subsequent (secondary) failure of a strict GFD to restore normal intestinal structure and function and may result from several mechanisms . It is important to keep all these causes of refractory celiac sprue in mind and to investigate and treat for all these factors . Though SIBO and secondary lactose intolerance are expected and known to be common in celiac disease, until recently [3, 15], only a few reports have been published on this issue [16, 17]. Though normalization of duodenal histology may take long time up to one to two years, clinical response such as reduction in diarrhea and weight gain occurs within weeks . Failure of normalization of duodenal histology has been proposed as a criterion for diagnosis of refractory sprue . Persistent symptoms despite normalization of duodenal histology may suggest causes other than refractory sprue such as SIBO and lactose intolerance. In conclusion, we believe that if diarrhea persists in a patient with celiac disease despite improvement in duodenal biopsy and D-xylose absorption, lactose intolerance and SIBO should be suspected; appropriate investigations and treatment for these may result in complete recovery. We thank the patients who are presented in this report for giving us written consent for publishing their data. Uday C Ghoshal was the clinician involved in the management of these patients, conceived the idea and drafted the manuscript. Ujjala Ghoshal standardized and performed microbiological works for the diagnosis of small intestinal bacterial overgrowth syndrome. Asha Misra performed the hydrogen breath tests. Gourdas Choudhuri supervised the works. All the authors read and approved the manuscript.